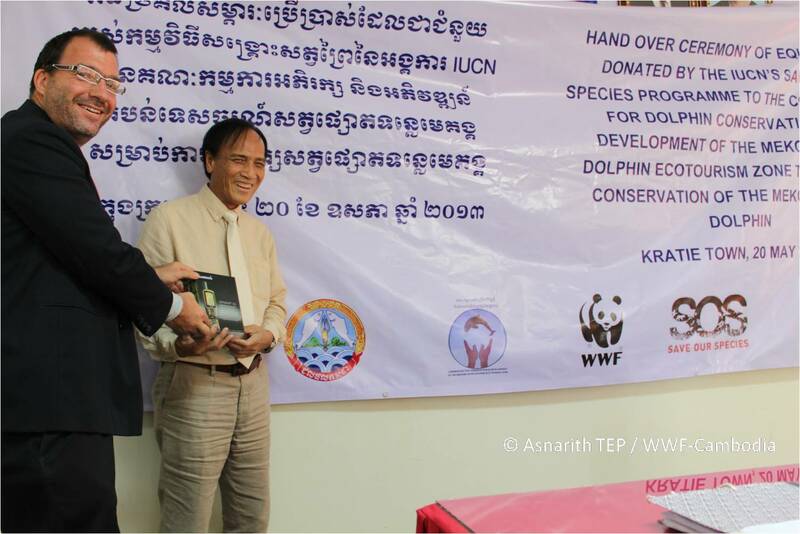 In May 2013, WWF organized a 4-day training course and handed over a range of equipment to the Cambodian Government’s Commission for Dolphin Conservation and Development of the Mekong Dolphin Ecotourism Zone (Dolphin Commission) to provide support for river guards in the protection of critically endangered Irrawaddy dolphins in the Mekong River. Financed by the IUCN’s Save Our Species Programme, the donated equipment include essential items such as radio communication tools, GPS units, life jackets, water-proof cameras, boat engines, enforcement uniforms and solar panels, and is expected to give a boost to the current efforts by the Dolphin Commission river guards, who enforce regulations related to fisheries and a Government sub-decree issued in August 2012 on ban of gillnet fishing within the dolphin habitat – a 190km stretch of the mainstream Mekong River between Kratie, Cambodia and Khone Falls on the border with Lao PDR. All together twelve solar panels are installed in 5 different river guard posts in Kratie and Steung Treng provinces, where dolphin pools are located. With support from WWF, members of the Dolphin Commission enforcement units received a course conducted by the Khmer Solar Company on use and maintenance of solar system. According to Mr Thibault Ledecq, Conservation Programme Manager with WWF-Cambodia, all of the support will no doubt fortify the pillars that boost the river guards’ enforcement presence. “WWF values this collaborative partnership, and looks forward to continue working together in support of the sustainable development and conservation of the Mekong river biodiversity,” he said. The enforcement training conducted by Mr Crispian Barlow, WWF Greater Mekong’s Advisor for Protected Areas Enforcement, covered a variety of skills and topics essential for effective enforcement, including patrol and arrest techniques, first aid skills, use of GPS for geo-referencing locations and navigation, as well as understanding and applying legislations related to dolphin protection. “The work that river guards do is tough. With inadequate patrol equipment, and lack of funding, I realised how hard it was for the enforcement units to complete their mission. Hence, any training that builds up more knowledge and skills, and therefore more confidence, has got to be of benefit,” Mr Barlow said. 80 river guards work along the Mekong in Kratie and Steung Treng, and are at the frontline enforcing Cambodian laws that specifically protect the Mekong dolphins. The work itself involves long hours and days patrolling along the river and river guards face many challenges, from working in remote and harsh environments to facing life-threatening risks during patrol and arrest. “I was impressed with the dedication displayed and the friendly camaraderie that developed amongst officers who attended training. It shows that, given the right equipment, training and motivation, the man at the frontline is capable of doing his job, despite the challenges,” he added. 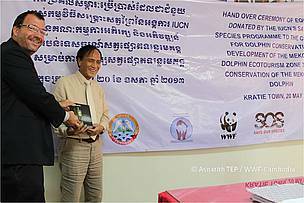 His Excellency Touch Seang Tana and Mr Thibault Ledecq at the handover ceremony of equipment donated by the IUCN’s Save Our Species Programme to the Commission for Dolphin Conservation and Ecotourism Development to support conservation of the Mekong River Dolphin. 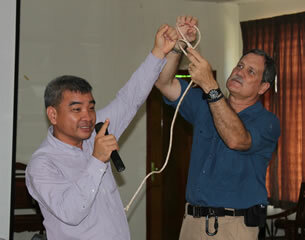 With help from Mr Phay Somany, WWF-Government liaison, Mr Barlow shows how to tie the figure 8 knot – a basic technique that helps rangers in the field. 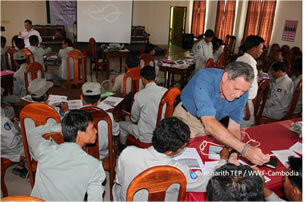 Mr Crispian Barlow interacts with river guards to demonstrate basic ranger skills.